Worried About Your Mattress Being Compressed In Shipping? Many consumers worry about buying a memory foam bed. Why? These consumers are worried about the bed being compressed. In order to ship memory foam, the mattress has to be compressed. The key is to buy the right memory foam mattress from the right retailer. If you do this, your memory foam mattress will be compressed temporarily (just long enough to ship it) instead of being compressed for months on end. Large, nationwide retailers carry memory foam beds, pillows and toppers that have been imported from China. These products stay compressed for months. Often times, these products have been compressed from the time they are manufactured until the time a consumer buys it. These products have been compressed for way too long and have probably lost all of their memory foam properties. When memory foam has been compressed too long, it becomes damaged. Instead of uncompressing, these products stay compressed long after you’ve unwrapped them. Memory foam should not be compressed for any longer than 2-3 months. If it is compressed longer than this time frame, it has a greater chance of becoming damaged. Memory foam products that sit on the shelf for months lose its ability to bounce back, its ability to conform to your body, its ability to reduce pressure points, and its functionality altogether. If you want to enjoy the many benefits of memory foam, you need to buy it from a specialty mattress retailer. These retailers carry the American-made memory foam. Not only is American memory foam a much higher quality, but it isn’t compressed until it is ready to be shipped. 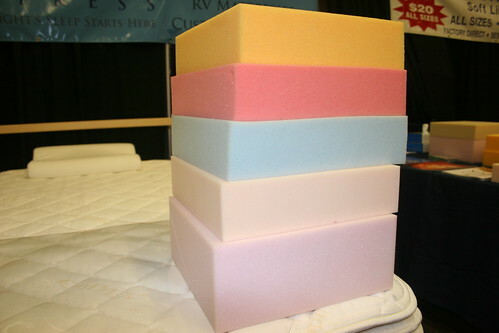 You can be sure that your memory foam stays fresh when you purchase an American-made memory foam product. In short, the problem isn’t that the memory foam is compressed, it is because the memory foam has been compressed for too long. Two to three months is the magic number to know if your memory foam product has been packaged for too long. Of course, Rocky Mountain Mattress does the whole process right and can help answer any questions you have. Just call Lane at 801-824-5503 today and ask! There is a reason memory foam mattresses were began being used in the health care industry. Memory foam mattresses have many medical benefits. Let’s take a look at a few of them. 1. Conforming. Memory foam mattresses aren’t rigid like other mattresses. While other mattresses resist the contours of your body, memory foam mattresses conform to the shape of your individual body. Memory foam mattresses use your body temperature to heat the foam. Once the foam is heated, it can conform to your favorite sleeping position. 2. Firm vs. Soft. Some mattresses are too firm. Other mattresses are too soft. It can be hard to find the perfect mix. The problem with mattresses that are too firm is that they do not provide you with optimal comfort. The problem with mattresses that are too soft is that they do not provide enough support. Memory foam mattresses are firm enough to keep your body supported, but soft enough to be completely comfortable. molds to your body. This delayed responsiveness allows memory foam to provide better orthopedic support. Memory foam distributes your weight evenly so that you can wake up the next morning ache and pain-free. 4. Pressure Points. Traditional mattresses can create pressure points instead of relieving them. Innerspring coils can eventually poke through the outer mattress layers. These coils end up poking you all night long. Memory foam mattresses do not contain any springs or coils. Because of this, memory foam relieves and alleviates pressure points. Memory foam is also more dense than other mattresses. This allows memory foam to disperse the few pressure points away from your vertebrae. Memory foam has been proven to dramatically reduce arthritis and can help relieve joint pains. These mattresses have also been very useful for patients who have recently undergone surgery. Memory foam mattresses are also very beneficial for pregnant women. If you want to enjoy the medical benefits of a memory foam mattress, you need to be sure to buy a quality mattress. Don’t waste your money on cheap imitations. These ‘memory foam’ mattresses won’t benefit your body at all. Stick to top-quality memory foam mattresses if you want to start feeling better physically, emotionally, and mentally. It can be a wonderful life if you use the right type of mattress. Life can be extremely stressful. Often times, the only way to relieve that stress is by relaxing on the perfect mattress. The problem is that many people aren’t using the perfect mattress. Instead of relieving stress, many mattresses create stress. Memory foam mattresses are the perfect mattress for any kind of sleeper. Memory foam mattresses go to work relieving harmful pressure points. These mattresses come in a variety of different densities which really benefit you as the sleeper. Memory foam uses your body temperature to heat the foam. When the foam has been slightly heated, it molds to your individual shape. If you are in the market for a new mattress, a memory foam mattress is just what you are looking for. Here is everything you need to know about buying the perfect memory foam mattress. 1. Density. It is important to choose the right density in order to get the perfect memory foam mattress. Density is a measurement of pounds per cubic foot. You can find memory foam with densities as low as a 1.5 pound density or as high as a 10.0 pound density. The higher the density, the more support you have. Also, the higher density you choose, the better quality mattress it will be. As density increases, the mattress is better able to relieve pressure points. As density increases, the more expensive it will be. However, a good quality of sleep is certainly worth the investment. We recommend not even looking at any mattress with a density lower than 4.0 pounds. 2. Firmness. Firmness is another important factor to consider. The firmness rating is measured in ILD. A good ILD range is between 10 and 14. Don’t consider any mattress with an ILD rating less than 8 or more than 16. Anything outside the range of 10 and 14 takes away from the memory foam aspect. 3. Thickness. Many people consider firmness and thickness to be identical. However, the thickness of a memory foam mattress affects the comfort of the mattress more than the firmness does. You can’t base the thickness of a memory foam mattress by the height of the mattress. Instead, you need to consider the thickness of memory foam inside the mattress. The ideal thickness range is between 2.5″ and 6″. Not enough memory foam will cause the mattress to be too firm and too much memory foam will cause your spine to be aligned improperly. 4. Scams. There are many imitation memory foam mattresses out there. These mattresses do not provide many, if any, of the benefits of quality memory foam mattresses. Don’t buy a memory foam mattress unless you are able to try it first in your home. You need time to see if the particular mattress will work for you. Don’t buy Asian-made memory foam. Many times, these memory foam mattresses have added clay inside them. Lastly, if it seems “too good to be true,” it probably is. Memory foam mattresses can be your answer to a good night’s sleep. However, you have to make sure that you do your homework first. Take the time to research different products and prices. Don’t hesitate to ask questions either. Follow these tips so you can make a wise purchase. I have a number of family members and friends who suffer from chronic back pain. It pains me to see them in so much pain. Each one of them has had to have back surgery. I have watched as some of them have gotten better and some of them haven’t. The men who have gotten better, interestingly enough, sleep on a memory foam mattress. Why would a memory foam mattress make any difference to back pain sufferers? Well, memory foam was invented by NASA in the 1970s. The material didn’t prove to be helpful for their needs. Instead, hospitals and health care facilities around the world began putting memory foam mattresses on their beds. Surprisingly enough, the memory foam mattresses actually aided many patients’ recovery process. Memory foam mattresses do an excellent job relieving pressure points. Instead of creating pressure points (like innerspring mattresses do), memory foam mattresses eliminate them completely. There are no steel coils or springs that can create pressure on your body. Instead, your body sleeps on a soft platform of memory foam. Memory foam mattresses use your body temperature to heat up the material. Once the memory foam is heated, it is able to mold to your individual shape. Whether you like to sleep on your back, side or stomach, a memory foam mattress can give you optimal comfort and support. You don’t have to live in constant back pain anymore. Back pain patients who sleep on a memory foam mattress often regain their strength and their pain is decreased dramatically. The more your back is supported and comforted during the night, the more you will be able to do during the day. If you need help with back pain, you definitely need to try a memory foam mattress. Memory foam mattresses have been used in the healthcare industry for decades because of their numerous health benefits. There is a reason why patients are put on a memory foam mattress after surgery. These mattresses have more medical and health benefits than any other type of mattress. Pressure Points. Some mattresses create pressure points. Memory foam mattresses eliminate pressure points. The NASA-developed technology used in memory foam mattresses helps distribute weight evenly. This means that pressure is also displaced evenly throughout the entire mattress. Temperature-sensitive Technology. Memory foam technology uses temperature-sensitive technology to warm the material. This technology puts less pressure on more sensitive areas. Less pressure means a better overall night sleep. Relief from Sleep Apnea. Memory foam mattresses have been proven to reduce sleep apnea. The way or position someone sleeps can affect sleep apnea. Memory foam pillows and mattresses can adjust the way a person sleeps to ensure proper breathing. Allergy Relief. Every home is susceptible to dust mites. While these critters aren’t harmful to the average person, they can be harmful to people who suffer from allergies and/or asthma. Dust mites aren’t able to live inside highly dense memory foam products. If you suffer from allergies or asthma, memory foam can reduce your side effects. Relief from Fibromyalgia. Many people who suffer from fibromyalgia claim that sleeping on memory foam reduces pain in their muscles. This relief is due, in part, to the redistribution of one’s weight. Pressure points are significantly reduced or even eliminated. An overall better night’s sleep. People who sleep on memory foam mattresses and/or pillows claim that these mattresses provide an overall better night’s sleep for them. These mattresses cradle you all night long, which reduces your need to toss and turn. You are able to sleep in a more natural position as well. Memory foam mattresses reduce morning soreness and keep the spine properly aligned during rest. Memory foam mattresses provide many health benefits. There is a reason why these mattresses have been used in the healthcare industry for so long. Try these mattresses for yourself to see what health benefits they will provide to you. A complete guide to the evolution of the memory foam mattress, and what it means for you. Millions of people around the world have begun to love memory foam mattresses. These mattresses offer the right amount of comfort and support. Many people think that memory foam mattresses were created within the last ten years. Let’s look at the evolution of the memory foam mattress. NASA designed the memory foam mattress in the 1970s. NASA’s intent was to develop a product that could decrease the amount of pressure that the astronauts experienced during lift-off. This product was actually never used in the space program. However, it didn’t take long before the medical industry discovered memory foam. Memory foam mattresses were used originally for patients who had to spend extended periods of time in bed. For instance, patients who had recently experienced a paralyzing stroke were put into beds with memory foam mattresses. Before, these patients had to lie on extremely firm mattresses. These mattresses actually decreased their blood flow and caused bed sores or even gangrene. Once memory foam mattresses were introduced, the amount and severity of such problems decreased dramatically. Initially, memory foam mattresses were only used in hospital settings because of how expensive they were. They were much too expensive for general use. However, it eventually became more cost-effective to produce the “miracle” mattresses. Since it doesn’t cost as much to manufacture memory foam mattresses, they are now widely available. You can get memory foam products in more than just a mattress. There are memory foam pillows, mattresses, mattress toppers, etc. Memory foam is also used in wheelchair cushions, hospital bed pillows, and padding used for people with long-term pain or postural problems. For instance, chronic neck pain is sometimes alleviated with a memory foam cervical pillow. Memory foam’s heat retention has also proven helpful. Some pain sufferers find that this heat-retention property also helps reduce their pain. Memory foam mattresses are more dense than other types of mattresses. They offer an unprecedented level of comfort and support for pain patients, long-term patients and ordinary people. Thank goodness NASA decided to create such a wonderful product. We know can experience exquisite comfort while sleeping every night. It’s about time your mattress started working for you. You’ve spent too many nights tossing and turning, just lying there wondering when you would finally fall asleep. You shouldn’t have to work hard to fall asleep than you do at your full-time job. You should be able to lie down on your bed and fall asleep within minutes. This viscoelasticity is what makes memory foam mattresses perfect for everyone. As the memory foam warms up to your body temperature, it gently molds into whatever position you are in. When you get up, it eventually returns to its original form. The ability to conform to your body gives you comfort and helps relieve pressure points. So, are you convinced yet? Take the time to shop for your next memory foam mattress online. You can save yourself a lot of money and it can actually be a pleasant experience. Keep in mind that some of the most expensive memory foam mattresses aren’t always the best quality. Check out the mattress customer reviews and the independent studies. You can be sure to get the best memory foam mattress for the cheapest price. Why Should You Buy Memory Foam Mattress? Here are 15 reasons why you should be sleeping on a a memory foam bed, and this information comes from clients who use to sleep on traditional spring mattresses, but now sleep on memory foam. Again, this information was gathered from a poll we took recently, so we hope you enjoy! There are so many reasons to buy a memory foam mattress. No matter what you are looking for in a mattress, the memory foam mattress has it. Here are some of the reasons why you should buy a memory foam mattress today. 1. It offers the best night’s sleep because it conforms to each individual person. 2. It is extremely cost effective because you won’t have to worry about buying another mattress and you’ll be getting a great night’s sleep. 3. Memory foam mattresses are the most durable mattresses out there because they don’t wear down as quickly as traditional mattresses do. 4. Memory foam mattresses don’t have any pressure points because they aren’t made of springs or coils. 5. They help alleviate your pressure points by conforming to your natural body shape. 6. You won’t wake up with morning soreness because it takes away pressure points. 7. No more tossing and turning for you. You’ll finally be able to get the rest you deserve. 8. You won’t be disturbed by the movements of your partner. 9. Memory foam mattresses suit everyone’s needs. Whether you prefer a soft mattress or a firm one, you’ll soon only prefer a memory foam mattress. 10. It keeps you comfortable all night long. 11. Memory foam mattresses provide unmatched comfort and support. 12. It distributes your weight and pressure evenly throughout the entire mattress. 13. You won’t have to try different mattresses anymore because you will have found the perfect mattress for a perfect night’s sleep. 14. You have the option of buying a complete mattress set or going with a memory foam mattress topper; either way, you’ll enjoy the benefits of a memory foam product. 15. Everyone is doing it. These are just a few of the reasons why you should buy a memory foam mattress. Memory foam mattresses really are a miracle product and will give you the comfort and support that you have been looking for. They are extremely cost effective and popular because they really deliver what they promise.